This week Illustrators 57, a survey exhibition of contemporary illustration art, comes to Humboldt State University's Reese Bullen Gallery in Arcata. Organized by the Society of Illustrators to commemorate its annual juried exhibition's 57th renewal, the traveling show consists of 40 artworks selected from among the nearly 500 in the original exhibition held earlier this year at the Museum of American Illustration in Newport, Rhode Island. Illustration is by definition commercial work; the images on display have previously appeared in a variety of contexts, including "magazine and newspaper publications, adult and children's books, calendars, theater posters, fashion labels, CD and album art, and advertisements for major corporations," according to the press release. They are grouped here into five categories: non-commissioned, editorial, book, advertising and institutional. The images evoke a striking range of mood and manner. 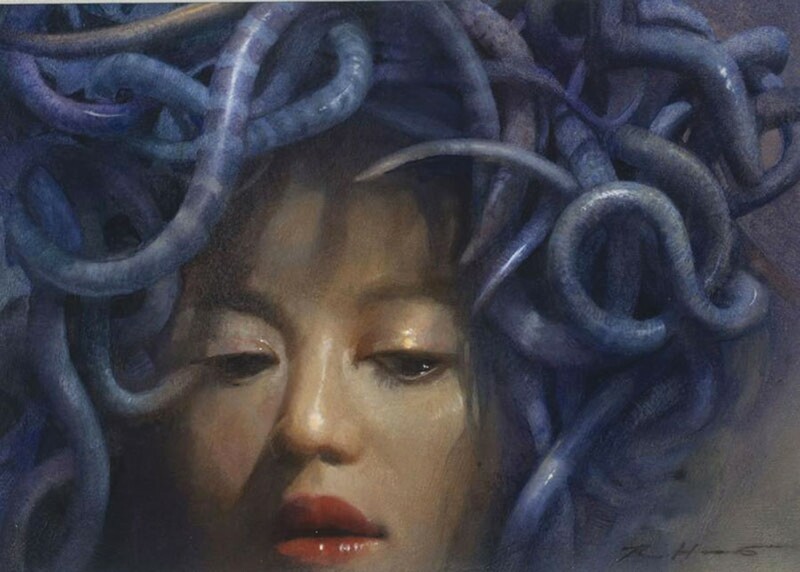 Robert Hunt paints "Medusa" as a doomed beauty beneath a slithering bonnet of asps that swoops fetchingly over one brow, Veronica Lake-style. 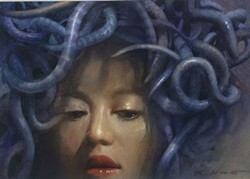 This conflict-averse Medusa helpfully averts her eyes, perhaps as a courtesy to hapless viewers. Hunt's practiced and economical paint handling is like a lot of illustration in the sense that it has a lean, telegraphic quality — every gesture counts and it looks as though each brushstroke were being called upon to suggest a clutch of fellow travelers. Engrossed in the contemplation of this picture, we're already at least halfway to a less Perseus-centric retelling of the myth. Unlike Hunt's work, Julianna Brion's crisp, layered image "The NPR Parade" is the obvious product of digital design. This image could only have been born inside a computer. It is a "digital native," as one says of people born in the 1990s. Brion's picture, a bold S-shaped composition in brilliant sky blue, white and gold, is built from silhouetted units that follow one of the founding conventions of digital design: Brion's work comes from a way of looking at a picture's surface as a palimpsest — superimposed layers, any one of which may be cloned, edited, filtered, duplicated, deleted, rendered translucent or otherwise manipulated. The picture's complexity emerges as layers are built up, image upon image, each one executed in a slightly different style: whimsical, graphic, naively simple. As a whole, the tableau conjures the sense of a dynamic collective that resonates with the founding principles of public radio. In Brian Stauffer's elegant allegory "Ambition" a rosy-breasted bird entangled in black cord strives upwards from a spray of leaves in gold and green. The neat, colorful surface appears deceptively calm; a second look reveals that the bird's efforts to free itself only draw the cord binding its wings tighter. The composition appears to be derived from collage, but it's impossible to say whether the sharp, slightly irregular contours of Stauffer's forms are real cut-and-paste or the Adobe Illustrator variety. The creative process can remain opaque because it's not the point. The picture succeeds by lending a memorable shape to hubristic self-defeat; it sheds some light on the subject, in just the way the etymology of the word "illustrate," from the Latin word for "to make bright," would lead you to expect. Of course, the process doesn't always work that way. Sometimes instead of clearing things up, illustrating text does the opposite. "Illustration" means, among other things, "the act of making clear and distinct." However, adding photographs, prints, drawings, paintings, digital images, GIFs or other pictures to text doesn't always clarify the written message, so much as it complicates and enriches the read. The literary theorist Roland Barthes and many critics who've followed him have explored how an image can bring forth multiple meanings. It certainly remains the source of much of their enduring fascination. While pictures tend to leave room for interpretation, illustrations like the ones in this show are unusual for their ability to channel that broadband potential for suggestion into laser-like messaging. When you see many such works in one place at the same time the effect can be slightly unnerving, but that should interest rather than dissuade intrepid viewers. Allow these masterful narratives to illustrate your world. Embrace the enlightenment. There will be an opening reception Thursday, Oct. 15 from 4:30 to 6:30 p.m., and the show runs through Nov. 12. The Reese Bullen Gallery is located inside HSU's Art building at B and Laurel streets in Arcata. The gallery is open Monday, Tuesday and Wednesday from noon to 5 p.m., Thursday from noon to 7 p.m., Friday from noon to 5 p.m., and Saturday from 10 a.m. to 2 p.m. Admission is free. For more information, call 826-5814.